Location: On N side of a minor road through Rudry immedietaly opposite the parish church. A National School with schoolmaster's house, said to have been built c1843 and first mentioned in 1847 as part of the government report on education in Wales. The school closed in 1902 when a new school was built, subsequent to which the building was used as a church hall while the house was occupied by the sexton. Also used as the village hall until a purpose-built hall replaced it in 1957. The building became a single dwelling in the late 1970s. 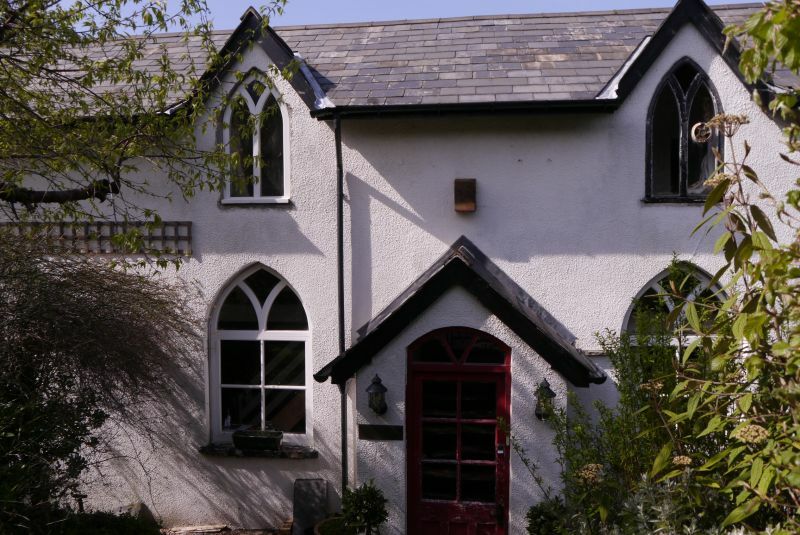 A long range in simple Gothic style of white rendered walls and slate roof in simple Gothic style. The former school to L is one storey with attic, the former school house to R of 2 storeys and attic. Rendered stacks to L gable end and between school and school house. The 3-window former school has a porch R of centre with a half-lit door and a boarded door inside. The windows are 2-light with pointed heads and Y-tracery. Smaller half dormers are similar. The double-fronted former school house has similar windows, and an added porch with half-lit door. The L gable end has added windows upper R and L similar to front, and an added 1-storey projection. Behind, the school has doorways R and L with French doors and pointed heads, and 3 half dormers similar to the front. Behind the school house is an added projection. Not inspected, but upper floor added in the former school room late 1970s. Included as an early example of a village school and for group value with the church of St James and other associated listed items. Above S side of a minor road between Caerphilly and Machen, in a large quadrangular churchyard.